Oh my goodness – I am so happy. This morning I experienced painting like a kid, our last exercise in Week #1 of BIG, even though I knew I was an adult with skills and experience. Forever, I’ve wanted to paint cherry trees blossoming and never dared do it…thinking I’d never be able to capture how looking through those trees makes me feel. In a nearby school yard, there is a blossoming cherry tree even though large flakes of snow are drifting down today. Yesterday I passed it while walking my dogs and inwardly cooed over its beauty. 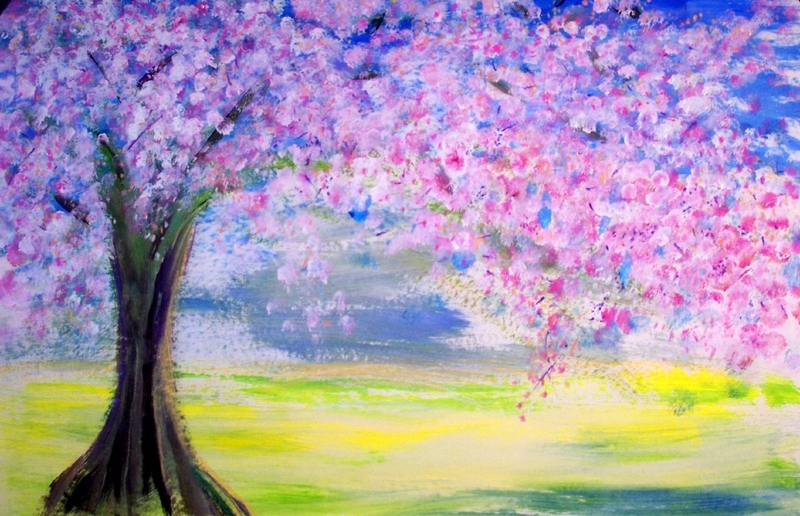 Today when I asked my soul what to paint as a kid, cherry blossoms surfaced immediately. I kept chanting things like: Keep it simple. How does it feel, how do I paint the look of my feelings, how do those kazillion-pink-and-white-gossamer-piled-on-top-of-each-other blossoms make me feel???? Do what it takes to bring out the feeling. Attitude is everything. I never doubted myself. What a joy! I think there may be a series coming from this when BIG is over. This entry was posted in truth and tagged attitude is everything, expressing, feelings, flow, love, trust. Bookmark the permalink. You did it. Soft pink breath against blue. Uncomplicated by anything else. Clear and to the point, just LIKE a child. Thank you. How childish of you, Deborah! How wonderfully, beautifully childish! Your words, across all theses miles made my heart do a happy flip-flop this Monday morning. One day, we will again walk and talk! I miss you. And now I flip-flop with gladness back. So good to know we connect across the miles. come visit come visit. And I intend to drive over those mountains from here to there in mid June…we will indeed walk and talk again.